I fully intended to share these babies a week or more ago because they make a perfect end-of-year teacher gift. But summer is here already for my kids (and probably yours too) and my schedule has gone from having one to….basically none at all. Thus, no post written…so better late than never. Here ya go. 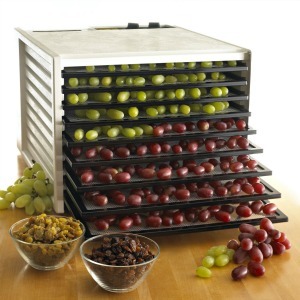 I know I’ve mentioned it here before, but my husband seems to have an unnatural affinity for my Excalibur Dehydrator. He is always looking for excuses to use this baby. When that thing comes out of the pantry I know that there are going to be some fun things emerging…and a lot of space getting taken up on my counter. But, he has gotten quite creative over the last couple of years and I have yet to share one of his masterpieces. So, with Father’s Day approaching, I thought today would be a good day for me to give some kudos to one of the best hands-on, involved, and FUN dads I know…my hot husband. This guy can make a mean banana chip, a perfect fruit leather, drool-worthy raw power bars, and dried mangoes like nobody’s business. 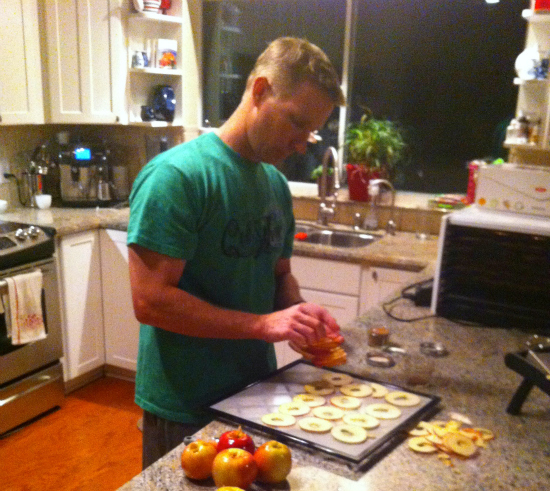 But, today I’ll just brag about his insanely amazing Cinnamon Apple Chips. 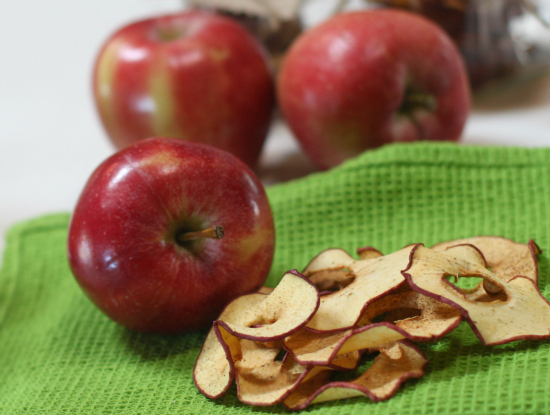 These super Easy Cinnamon-Apple Chips use 2 ingredients…guess which two…. Yup. Cinnamon and Apples. That’s it. The key to making these babies nice and perfectly crispy is by using a Mandoline Slicer on the 1/4 inch setting. 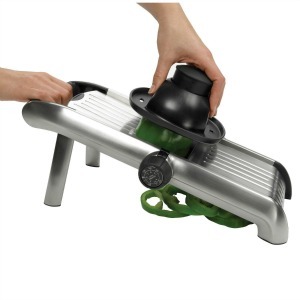 And I’m just going on record here to say that I think that the Mandoline is also the key to my husband’s love affair with this whole dehydrating process. The guy loves that handy gadget and looks for reasons to use it. Oh, I’ll give him one more major credit today… Since some Dehydrators (like mine) do not have an automatic shut-off timer, it is a pain if you need to shut off your dehydrator in the middle of the night. My husband came up with the BRILLIANT idea of plugging the dehydrator in to an inexpensive lamp timer and then just setting it for the time he would want to shut it off. Problem solved. Works like a charm. That idea alone deserves some major Father’s Day love! 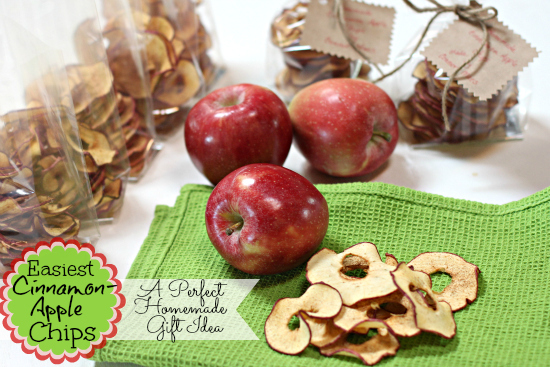 This year, I decided to give these Homemade Cinnamon Apple Chips to each of my boy’s teachers along with a little Amazon Gift Card. It seemed like a fitting gift and got rave reviews from everyone. And since I did not get this post out before most of your kiddos were out of school, you can just tuck this little nugget of an idea in the back of your mind and pull it out next year when you are running around like crazy trying to come up with that perfect gift idea. 1. Wash and core the apples. Using a Mandoline, or a really good knife and a steady hand, cut the apple into 1/4 inch rings. Lay rings evenly on your dehydrator trays so they are not touching. Sprinkle apples evenly with cinnamon. Place trays in dehydrator. 2. Dry at 135 degrees F for about 7 – 8 hours, until desired crispness is reached. If your climate tends to be more humid, you can increase the time to about 9 hours. Note 1: Some Dehydrators (like mine) do not have an automatic shut-off timer. If that is the case, just get an inexpensive lamp timer and plug the dehydrator into that and set it for the amount of time you need and then it will just shut off on it’s own. Note 2: You can also make these in your oven. Simply set your oven to 200 degrees. Prepare as listed in Step 1 and then bake them for about 2 1/2 hours, flipping once half-way through. HAPPY SUMMER BREAK EVERYONE!! HOPE YOU ARE STARTING IT OFF WITH A BANG! Kim Maes, CNC, AADP, known as the Allergy Free Food Coach, is a Certified Nutrition and Wellness Consultant and Certified in the Practical Application of Food Allergy Guidelines.. She is also the creator of the Cook It Allergy Free iPhone and iPad Apps and the Cook It Allergy Free website, where she shares her passion for teaching others how easy and delicious it can be to eat whole, pure allergy-friendly meals that the entire family will enjoy. Those look amazing and probably so much cheaper to make your own than the ones I buy. Kim, I love how you highlighted your husband in this post! He sounds like a real keeper. 🙂 Those apple chips look perfect! Sigh. No dehydrator or mandoline here. I’m still considering both and this post makes me want them. Thanks so much, Linda… He is a good guy. I got lucky. 😉 I think you would love a dehydrator AND a mandolin. Both get a TON of use in our house! I think you are his biggest fan, Mom… and I do agree..he is the BEST EVER. 😉 I’m lucky. I cant wait to try these! You mentioned dried mango slices,Have you posted how to do that? I looked but couldn’t find it. My daughters first fruit 17 years ago was a mango, and she still LOVES them! I would love to know how to make the mango slices if you have time to share, I know summer is a super busy time. I just cant seem to find a good dried mango and have always wanted to try drying them on my own. Thanks !!! Kaitys mom. That is so cool that the hubby dehydrates, too! Quick question lady, I attempted to make apple chips in the oven, and it worked, but in a round-about way. They didn’t seem to be crisping up, so I gave up and said they would just be dry. But after just a little time out of the oven, they crisped up like chips. Is this normal that they might still be a little soft when done, but turn into chips after cooling? Logic is telling me yes, but most directions I find via dehydrating say to cook until crisp. ALisa, that is totally what happens. They seem to dry up and crisp up a little more once they are done… especially since the climate you and I live in is far dryer. 😉 I find if I dry them until actually crisp they actually get too crispy as they sit for another day.